My sister, Jacquie, found these great vintage sheets while trolling for goodies at an estate sale. The plan is to make some dresses and skirts for the girls, lots of aprons (maybe one or two like this). 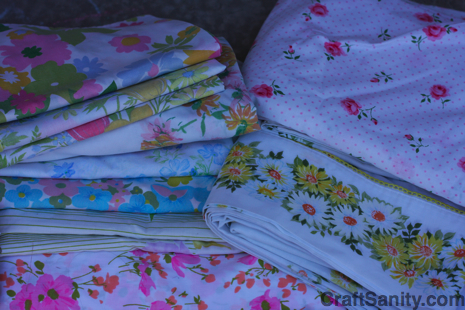 Then maybe we’ll use the scraps to make a vintage sheet quilt, too. I just love vintage fabric and I think these prints are too pretty to tear up for crocheted rugs. What have you made with vintage fabric? True Colors. Pretty Fabric. Fun Blog Tour. We absolutely love your blog and find almost all of your post’s to be exactly I’m looking for. Does one offer guest writers to write content for you? I wouldn’t mind creating an article or elaborating on a number of the subjects you write related to here. Great weblog! I beloved up to you’ll obtain performed proper here. The caricature is attractive, your authored subject matter stylish. nonetheless, you command get got an shakiness over that you wish be delivering the following. unwell undoubtedly come further in the past again since exactly the same nearly a lot often inside of case you shield this hike.